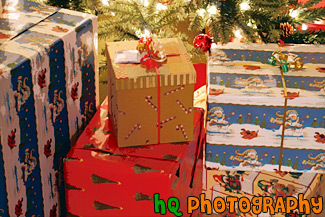 A close up picture taken of a couple Christmas presents under the green decorated Christmas tree. In this picture you can see the white Christmas lights and ornaments on the tree. 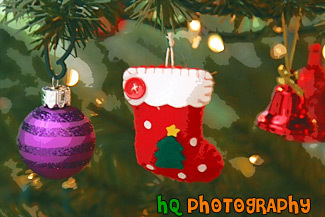 A close up picture taken of a red Christmas stocking ornament on a Christmas tree. There is also a purple ball and red bell ornament seen in this photo. 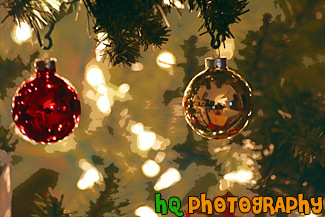 A scenic picture taken close up of a bunch of decorated Christmas tree ornaments. Red, silver, blue, and gold balls are seen on the tree along with a red bell and silver star. 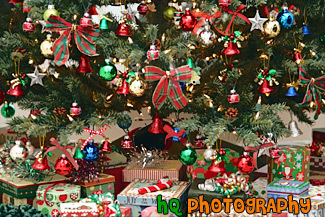 A close up scenic picture taken of Christmas ornaments hanging from a Christmas tree with presents seen underneath the tree. A close up scenic picture taken of a Christmas ornaments on a Christmas tree during the holiday season. 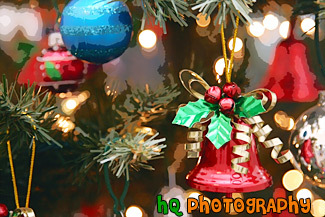 A red bell and blue ball are prominent in this picture of ornaments. 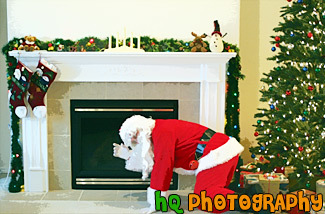 A scenic picture taken of Santa Claus kneeling by the fireplace next to the decorated Christmas tree with presents underneath. A picture taken of Santa Claus by the Christmas tree delivering some last minute presents. Santa is dressed in his red jacket and pants. A close up picture taken of Santa Claus standing in front of a decorated green Christmas tree. 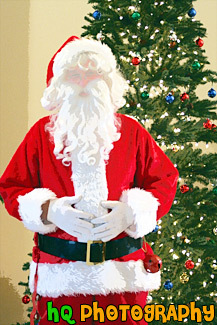 Santa is wearing is red outfit, stanta hat, and has a long white beard. 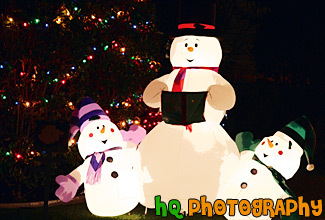 A scenic picture taken of three blow up snowman located in a homeowner's yard during the Christmas season. This picture was taken at night and you can see the snowmen all lit up. All the snowmen have carrot noses. 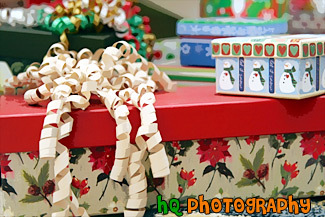 A close up picture taken of Christmas decorated boxes during the winter holiday season. 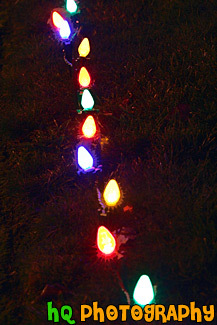 A scenic close up picture taken of some Christmas lights that border a homeowner's yard and the grass. 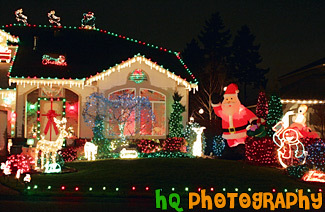 A scenic picture taken of some beautiful Christmas lights decoration on a homeowner's house. 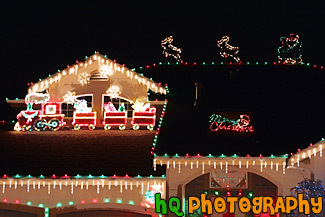 To the left is a lit up train and on top of the house to the right is some reindeer. A scenic picture capturing the Christmas holiday season as this homeowner has greatly decorated their house and yard with Christmas lights and Christmas decorations. 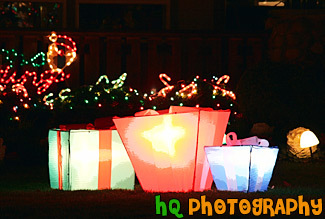 A lit up Santa and reindeer can be found in the yard. 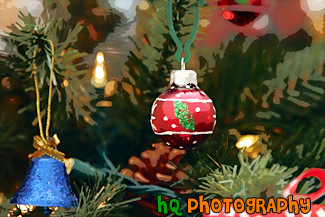 A close up picutre taken of two Christmas ornaments located on the decorated Christmas tree with presents underneath. If you look closely in the gold ornament, you can see the reflection of the Christmas presents under the Christmas tree and the tv and other parts of the room. 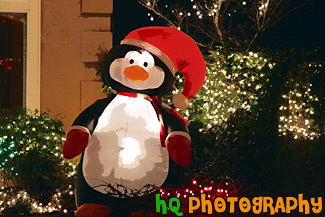 A close up picture taken of a scenic blow-up Christmas penguin located in a homeowner's front yard during the Christmas holiday. The trees behind the penguin are also decorated with Christmas lights. A close up picture taken of some Christmas presents sitting under a Christmas tree during the holidays. 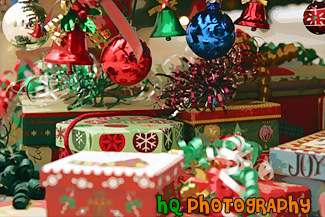 A close up picture taken of a bunch of Christmas ornaments and decoration on a Christmas tree with presents seen underneath. 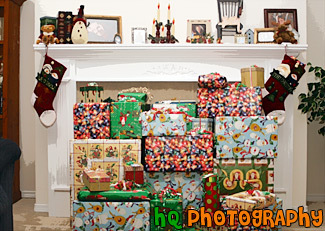 A scenic picture taken of a stack of Christmas presents located in front of a fireplace mantel during the holidays. A scenic picture taken of two Christmas stockings hanging from the mantle above the fireplace. 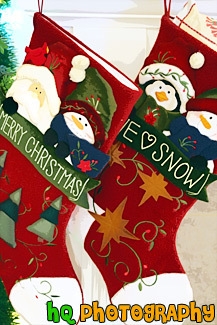 The first stocking says "Merry Christmas" and the one on the right says "We [heart] Snow." Both are red and decorated to the Christmas theme. 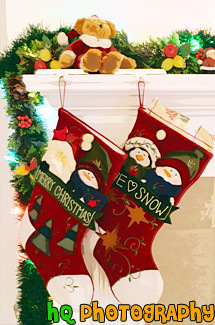 A close up picture take of two Christmas stockings located on a white mantel above the fireplace. These stockings are red and are decorated to the Christams theme. 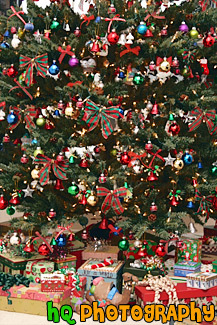 A close up picture taken of a Christmas tree decorated with ornaments and presents seen underneath. 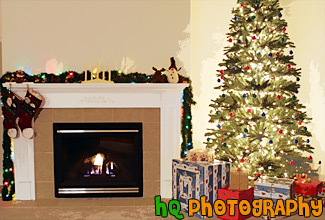 A scenic picture taken of a decorated Christmas tree with presents underneath next to a roaring fireplace. The fireplace mantel is also decorated to the Christmas theme with lights displayed over it and two stockings hanging from it. 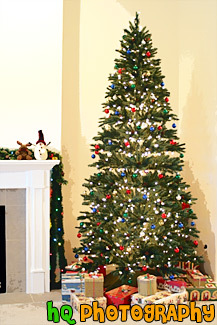 A scenic picture of a decorated, tall, and green Christmas tree with a bunch of presents sitting underneath. The Christmas tree is sitting in the corner next to the fireplace. 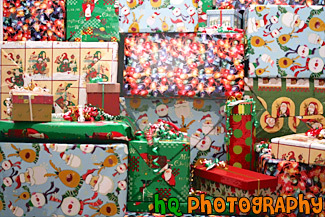 A close up picture taken of a decorated Christmas tree with presents seen underneath. Lots of ornaments are hanging from this tree. 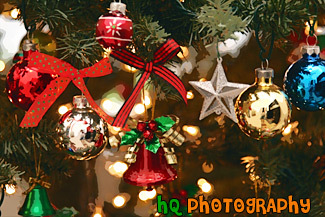 A close up picture taken of some ornaments and decoration on a Christmas tree. 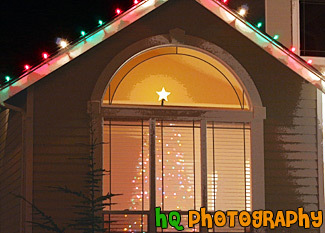 A scenic picture taken of a lit up Christmas tree seen from the outside of a house looking in through the window. The window curtains are closed but you can see the tree through the faint, white curtains. The Christmas tree is decorated with colorful lights and a bright star on top. A scenic photo taken close up of a wreath covered in white snow. Christmas is in the air. This photo was taken during the winter season as Christmas was getting closer. 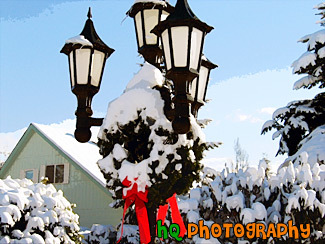 People were decorating their houses along with street poles to make the season more jolly. 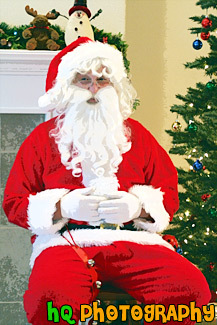 A close up picture taken of Santa Claus sitting in chair near the Christmas Tree. In this picture Santa has a long white beard and is wearing his red suite. Santa Claus is a cousin to Europe's legendary St. Nicolas whose feast day is Dec. 6. But while Nicholas is shown as a slender man in a long, hooded coat, Santa is a fat, jolly elf. His name likely comes from the Dutch version of St. Nicholas which they call Sinterklaas (which when said in the Dutch language sounds a lot like the words Santa Claus to those who speak the English language). 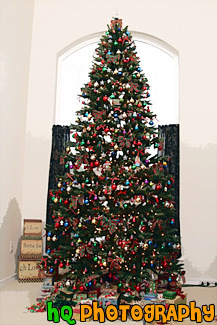 A vertical full picture taken of a decorated Christmas tree during the holiday season. Christmas boxes are seen under the tree. 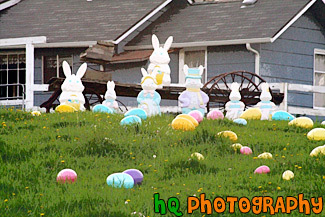 A scenic picture of an Easter display that a home owner placed in their yard. The display contains bunny rabits and large colorful Easter eggs. 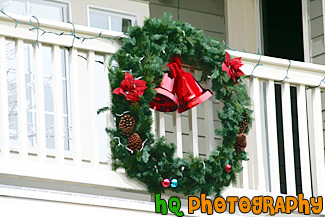 A close up scenic picture taken of a green Christmas wreath with red bells in the center. This reef was found on the outside of a second story balcany. 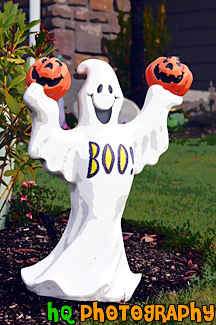 A close up picture taken of a Halloween decoration in the yard of some home owners. 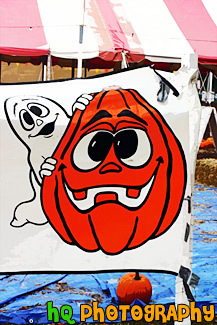 This is a picture of a white ghost holding two orange pumpkins with "Boo!" written on the front of it. A photo of a ghost and pumpkin sign at a local pumpkin patch in San Jose, California during Halloween. A vertical picture taken of a halloween pumpkin decoration that lights up in the dark. Three pumpkins are on top of each other. 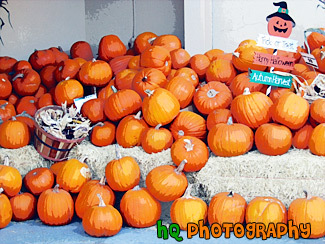 A picture of a bunch up of pumpkins with Halloween decorations. During this time of year grocery stores and other businesses place a lot of pumpkins out for sale to celebrate the upcoming holiday, Halloween. Halloween is a holiday in which kids dress up in costumes and go around their neighborhoods "trick or treating." A close up picture taken of some Halloween decorations on a house. 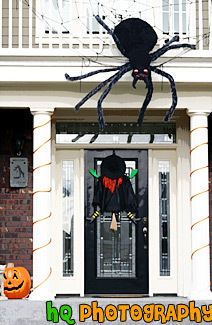 In the picture you can see a huge spider hanging down from the upper level and a witch on the door. It looks like the witch was riding her broom when she crashed into the door! 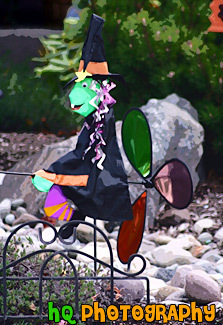 A close up picture taken of a green Halloween witch riding a broom. 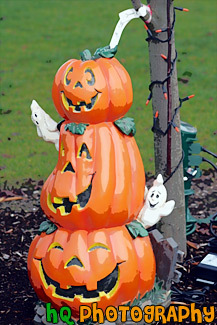 This which was found as part of a 2005 Halloween yard decoration for some home owners. 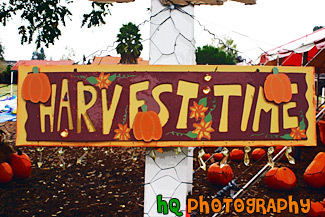 A scenic photo of a sign located in a pumpkin patch reading "Harvest Time." This pumpkin patch was located in San Jose, California. 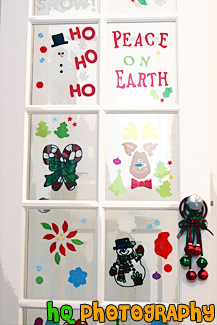 A vertical picture taken of some Christmas holiday decorations seen on the glass windows of a door. 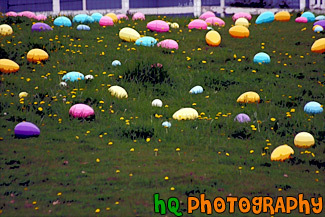 A scenic picture of large, colorful Easter eggs laying on grass in somebody's yard. A scenic photo taken of big lit up Christmas presents on display in a homeowner's front yard. There is a green, red, and blue present located next to each other lit up with Christmas lights. 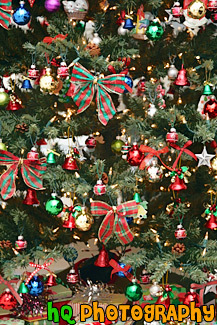 A close up vertical picture taken of Christmas ornaments on a Christmas tree. 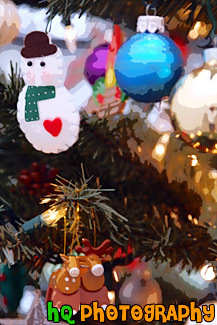 A snowman ornament and reindeer ornament can be seen in the photo. 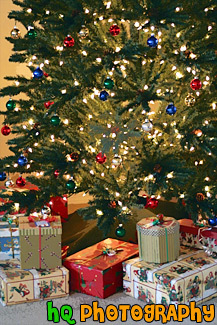 A close up vertical picture taken of presents under a Christmas tree. 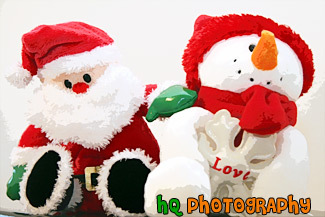 A close up picture taken of two winter holiday stuffed dolls - a Santa Claus and snowman. 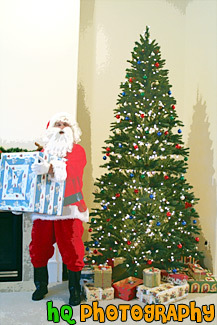 A vertical picture taken of Santa Claus holding a big present by the Christmas tree with other gifts seen underneath. 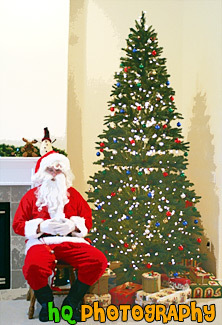 A scenic picture taken of Santa Claus in his red outfit sitting by a decorated green Christmas Tree filled with presents underneath. Santa has a long white beard and his wearing his santa hat. 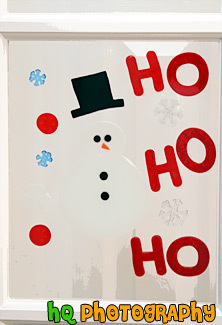 A close up picture taken of a winter snowman Christmas season decoration on a glass door window. 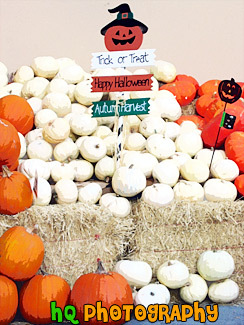 A close up picture of a bunch up of pumpkins and Halloween signs. During this time of year grocery stores and other businesses place a lot of pumpkins out for sale to celebrate the upcoming holiday, Halloween. Halloween is a holiday in which kids dress up in costumes and go around their neighborhoods "trick or treating." Neighbors fill the children's bags up with halloween candy!